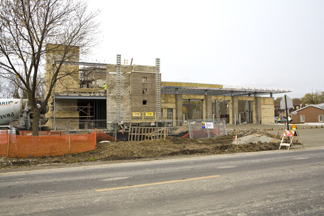 Work is progressing on the construction of Mount Prospect‘s new station 14 (Division 1). The apron was poured today and the exterior walls are being completed. 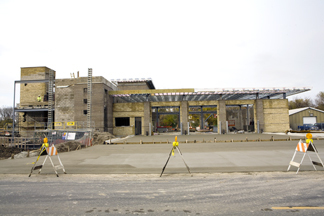 The link to the Station 14 page on the website offers a view of the construction as of early September. The Des Plaines Fire Department (in both Divisions 1 and 3) is awaiting delivery of a replacement for Engine 63. The new rig, from Pierce, will have the same body design as Engines 61 and 62 but the chassis will be different. Engine 63 will feature an Arrow XT chassis while the older, twin engines, were built on Dash chassis. The Prospect Heights Fire Department in Division 3 recently took delivery of a 2009 Ford F450SD/Medtec Type III ambulance (#8421) which will enter service soon as Ambulance 9. The Mokena FPD (Division 19) has opened their third station – a temporary site – at 11215 w. 83rd Place. With this new location, there has been some shifting and a reassignment of apparatus. Ambulance 6634 and Engine 6631 are assigned to the new station. The photos reflect their previous numbering (as Ambulance 6624 and Engine 6621). Engine 66R is now running as Engine 6621 out of station 2 where there is no longer an ambulance. All three stations photos are from Bill Friedrich who also provided the updated rig placements. Another addition to Division 19. The Lockport Township FPD in Will County (Division 19) has been added to the website. All 6 stations are up and almost complete. Thanks to Karl Klotz for all of the photos. Anyone interested in ARFF units will enjoy browsing through this suburban department that maintains 2 Amertek Crash Rescue Trucks. 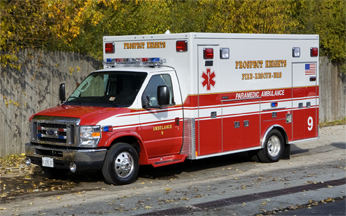 The department is also ordering a 2010 IHC Horton ambulance to replace ambulance 1. The new unit is expected next summer. The engine photos are from Steve Redick and Dennis McGuire, Jr., the station photos are from Hank Sajovic, and the patches are from Jack Connors. The Phoenix Fire Department in Division 24 has been uploaded to the site minus a photo of the firehouse. In addition, all four stations in Harvey have also been posted except for one spare engine. Karl Klotz provided images for 3 of the Harvey stations and we welcome the submissions of Dennis McGuire, Jr. to the site. Dennis provided the images for the Phoenix and Harvey rigs along with the image of Harvey Sta 2. The 2 stations of the Countryside FPD have been added to Division 4 in Lake County. They have quite a few rigs packed into 2 houses and only 1 rig is missing. They also have 2 new rigs on order that will be mentioned as soon as the specs have been verified.